We are all now aware that around the world, Bees are disappearing and they need our help! After the success of last year’s campaign, Burt’s Bees®, in partnership with the British Beekeepers Association, is re launching the Honey Bee Health campaign, #BringBackTheBees, and this time, they are going global, activating across the not just the UK, but Germany and Korea too. This spring, their Strawberry Lip Balm has been given a limited edition makeover. Did you know that without pollinators like the bees, the delicious and colourful Strawberry wouldn’t exist? In fact, one third of all the food we eat is thanks to pollinators like the bees, and many more of our favourite fruit and vegetables would simply disappear without them. 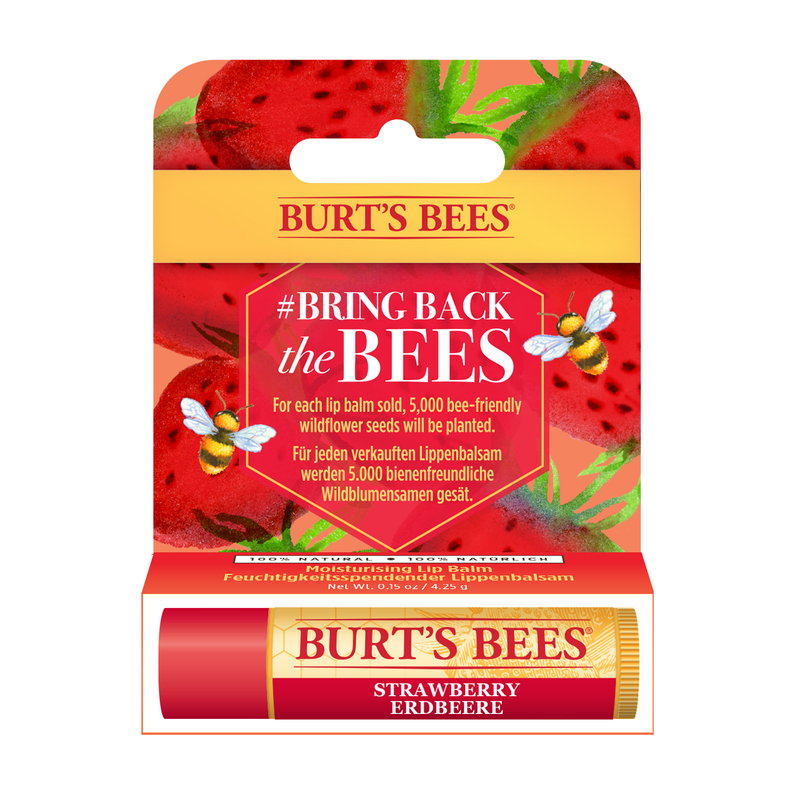 Burt’s Bees® wants to ensure that never happens and so for every Limited Edition Strawberry Lip Balm sold, 5,000 bee-friendly wildflower seeds will be planted, in partnership with the British Beekeepers Association, in selected areas nationwide, offering nearby bees a nutritious and much-needed feast. If that doesn’t inspire you then may be a few little facts will help capture your imagination:- Loss of foraging space is a key Beekeeper concern, which is why beekeepers are so delighted to be able to plant the free seeds from Burt’s Bees®. Somewhere between 75%-95% of all flowering plants on earth rely on pollination to survive. Many soft fruits will not bear fruit unless insects pollinate them, and the honey bee is the most important of all pollinators. Researchers from the University of California have found that western honey bees are the world’s most important single species of pollinator of natural ecosystems. Traditional British varieties of fruits such as strawberries, raspberries, blackberries, apples, pears, apricots and peaches all need pollination to bear fruit. Honey bees never sleep. The Queen Bee will live up to 40 times longer than a worker bee. Burt’s Bees Strawberry Lip Balm will be available from Feel Unique, Ocado, and Amazon.